Hoki Maru. Gene and Judy, Paul and myself boogie into the water and down to the aft hold where there is a bulldozer, paver, trucks and other equipment. I missed the hold at first and drop over the side, but realize that at 128' I'm alongside the rudder. Oops. Back up and into the small littered hold, squeezing through the girders and drop down to the between decks where the equipment is. We manage to get our shots just before the thundering herd of fellow divers descends on us. Out and back aft I follow Gene into the steering station where the remains of the rudder gears and lines are. After that we break up and cruise around the wreck, not seeing anything too remarkable. Viz is much better here, maybe 80-100'. Finished the dive up the mast where the color is wonderful, I try to frame some divers in the structure to not much avail. Fujikama Maru. 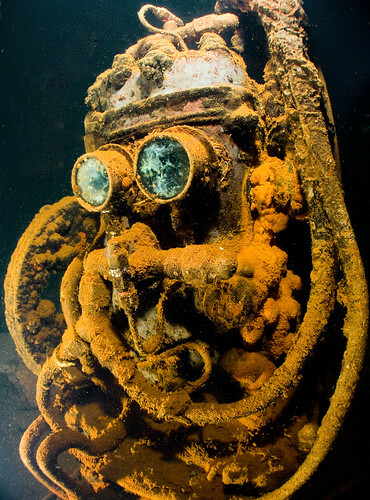 This is a "money wreck" (what I call a dive site that you spend the money on a trip to see), lots to see and at a decent depth so there's lots of time. Sam, olur guide, leads Paul and myself on a tour of the engine room and machine shop. The wreck is more open then I remembered from last time, but still some tight squeezes, especially with the camera. We luck out and are the first to get to the machine shop and I get some good shots of the air compressor, nicknamed R2D2 that's pretty famous. After that I shoot the lathe and then back out to the engine room as the herd descends and spoils the viz. We continue out into the superstructure and I frame some shots in the openings, definitely deteriorated since 4 years ago, with more marine growth as a result as the light hits it more. We duck out a window and then decide to go to the hold with the zero airplane fuselages. Dropping back into it there's lots to look at and I'm able to get some nice shots with he dome lens, still having some weird light flare issues, even pulling the strobe back and out. Back out and I've used up my camera card, but linger a bit on the king posts, where there's very nice growth. I go into a couple mins deco, but clear by the time I get to 20'. Paul and I head for the bow as I thought this wreck had some nice anchor lines going out that were covered with soft coral. This wasn't the case, but there was an interesting anchor still on the starboard side and as I shot it I spied a couple of grey reef sharks out in the gloom, as well as the school of snapper and jacks that the sharks were interested in. They circled around a bit, but never really came close, especially after a guide tried swimming out after them....no comment. Took a few deckscapes and then dropped over the side again after I saw a small school of tuna down near the bottom. Thought I might be able to drop down on them quietly, bu they were aware of me and lazily swam off. Likewise a few snapper wearily kept their distance. I swam around the bottom at around 90' and thought I might wake up a large fish or something, but nobody was home. Came back up and swam around the deck, finishing the dive trying my luck shooting macro of some pink anemone fish, with about the same results as the rest of the dive...mediocre. Came up, downloaded the pics to find that on the previous dive I had marred the dome lens enough that it was causing the camera to loose focus or for the marrs to show up on the shots...ARRRGH. Evening night dive. Paul and I splash about 6 pm again and make for the aft of the Fujikawa, as we haven't toured it yet. Paul drops into the last hold and I follow after making sure it is pretty open and easy to find my way out of. It seems to be filled with saki bottles and other assorted cooking gear as well and what looks like a canoe or something. We come out and find a few artifacts on deck and then I drop over the stern to see if anything is lurking there to shoot. Nothing but some nice small coral displays. We look around for a while, then at 1650 pounds of remaining gas, start to head back up towards the aft king posts as was our plan after hearing that the corals were nice there. I think the Fujikawa Maru is in danger of being over-loved and dove. There is a lot there and everyone enjoys poking around in the moderate depths, but it's looking pretty beat up to my eyes. Broken coral, scraped areas and trashed holds seem to be the norm. Even then, it's still a great dive. Unikai Maru. The morning dive is on a freighter that has heavy bomb damage forward, actually splitting the ship in two. It's at moderate depths, so we start towards the stern, duck in a shoot up towards a missing skylight. I swim around the stern shooting heavily encrusted depth charges on the rails and some gangways and so forth. I then see some nudibranchs, and as it is the first I've seen and had time to shoot, I switch to macro mode and blaze away, lying on the deck at 100'. Swimming alongside the cabin I see a small school of jacks going after some small fry excitedly. Continuing along towards where the bow was, I see another nudibranch in some green growth, and then a neat flat worm out in the open. It pays to look small sometimes, and most of the trip has been w/a. I also shoot some artistically arranged gas masks and then play around shooting some sun balls behind the masts, but am unable to get Paul in the position that I want. Sort of a "more of the same" dive, but a nice little wreck. Pizion Reef Shark Feeding dive. We've been warned that we might not be able to do this, but skipper Nick is pleased to tell us at the morning brief that the weather is quite good and the trades are finally filling in to hold us off the reef while we dive. 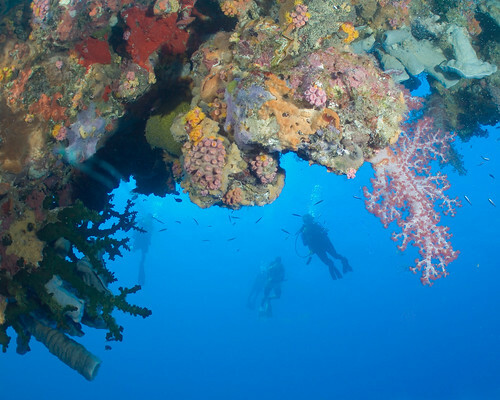 We motor about 1.5 hrs out of the lagoon and swing south to the low lying reef where they have put in a mooring. 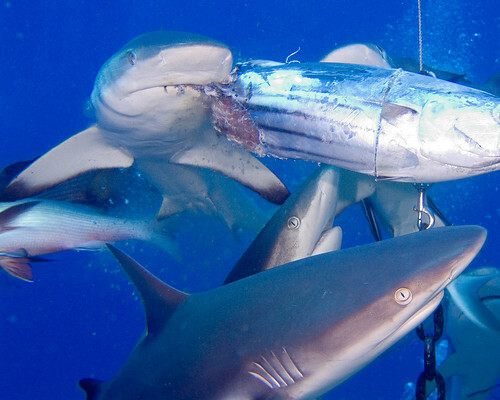 After chumming up the sharks a bit and briefing us on what to expect, we all get into the water and sit in a natural amphitheater around a tethered wire and when the fill a lift bag it brings down a large chunk of frozen tuna. 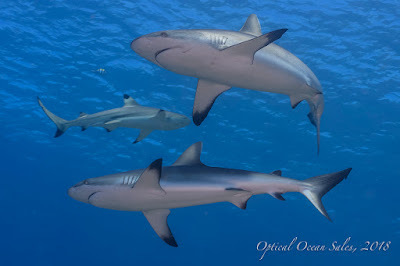 We are surrounded by lots of 5-6' grey reef sharks, a few smaller black tips and a large school of snapper as well. They go after it a bit at first, then in a huge ball of fish excitedly trying to tear chunks out of it. It's frozen very hard and each of the two chunks takes 15 mins to be fought over and disappear. When the first chunk is being fought over they are able to pull the line over a bit practically in my lap. I gamely keep taking pictures, finally switching to a w/a lens. After my strobe arms are hit repeatedly and I have to punch several away from me, I decide to move over a bit, which is hard to do on the rocks. I also find that guide Charlie is riding herd on me, keeping them from hitting me in the head from the rear. I actually am fairly non-plussed, as after feeding the fish in the Seattle Aquarium it's not unlike the big king salmon bashing me around. Ok, these fish have teeth, but they are only after the food, and really don't concern me much. Towards the end of the feeding a few much larger silver tips come in, including about a 11-12' female that the guides think is pregnant. She's the queen of the reef and takes no guff from the reef sharks. They are very elegant animals and even after the feeding is done I go down the wall a bit to 90' and watch them all swim back and forth. There was a huge temperature thermocline there, with the water 10-15 degrees cooler, and I think the larger animals like it. I meander up to the shallows and pick up Paul and we poke around seeing some little reef fish that are all to shy to shoot. Four years ago this area was a very pretty shallow dive with lots more fish and hard corals, but apparently a couple of typhoons have hit it hard and it's pretty dead, with only a few small bits of coral alive amongst mostly dead rock. We finish the dive sitting on the hang bar at 12' with the boat stern in 200' of water watching sharks go past in the crystal blue warm water. Shankisan Maru. Coming back into the lagoon we anchor over the blown apart stern of this ammunition freighter. Swimming over the melted remains of the stern we find the middle section of the ship and continue to the holds. Once again I find that the ship's cargo has been scattered around or taken. Before there were huge mounds of bullets in the aft hold, with lots of untouched cases stacked around. Now they are a fine layer along the bottom, with just a few cases left along with some detonators. 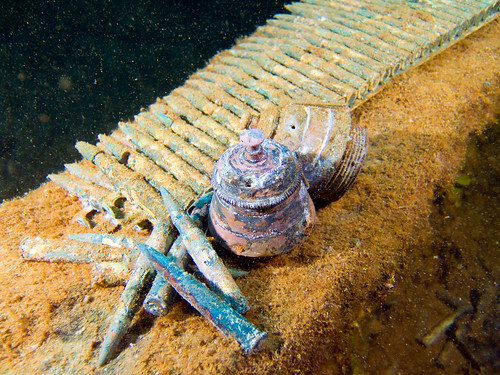 While they've enforced taking anything from the wrecks, they haven't enforced a no-touch rule and I think it's a shame to see such deterioration in the impact of the cargo to see. We continue along checking out some airplane engines and so forth and then swim up to the bow for a look to see if there's any interesting growth off the bow. Turning back, I swim up amidships and find a cleaning station with a couple of jacks or small tuna being cleaned by small colorful wrasses. As the wrasses pick off parasites, the jacks shiver with delight, quite amusing to watch. I loose Paul about that time and later find he ascended up the mast and then back to the boat. I continue on down the starboard rail, or what's left of it, and am rewarded with some large schools of black turbans and even quite a large, bump-headed parrotfish. I finish the dive shooting some nice soft coral and in the dusky light swim back trying to find the anchor line in blue water and after discerning the Odyssey, I see the anchor line which makes it easy to ascend and do deco. To cap the dive, I swim past a large barracuda hovering under the boat in near dark, as I make my way to the hang bar. I'm a bit worried about Paul, but they spot his bubbles just behind me and he's on deck a couple of mins later.